Apple certainly likes to keep its competition —and fans— guessing about its next moves, and one of the company's best head-fakes in recent years was an exclusive arrangement for a unique metal alloy dubbed Liquidmetal. News of that deal sparked fantasies of mythical Liquidmetal products built by Apple —wishful thinking that may now be repeating once again with the company's latest investment in sapphire. AppleInsider was first to discover back in 2010 that Apple had entered into a $20 million exclusive agreement to use amorphous metal alloys with unique atomic structures that could make products thinner, lighter, and resistant to wear and corrosion. The commercial name of this product was Liquidmetal, and the possibilities sent Apple fans into a frenzy. As a result, for the last four years silly rumors about Apple products made entirely of Liquidmetal have continued to appear. The claims have ranged from objects as small as an iPhone, all the way to a full Liquidmetal MacBook Pro. To date, some rumors still suggest the next iPad Air or the rumored "iWatch" will feature Liquidmetal chassis. In reality, Liquidmetal has been too unique and too expensive to produce in such large quantities. It's also difficult to work with. The inventor of the material himself noted that it would take an investment of hundreds of millions of dollars, in addition to years of time, before Apple could utilize Liquidmetal in large-scale products. In 2012, Dr. Atakan Peker foresaw Apple using the material for small operational parts such as hinges and brackets. Apple tested the viability of Liquidmetal by using it to make the SIM ejector tool included with the iPhone 3GS, but that's the largest known use for the material thus far. If Apple is using Liquidmetal on a large scale, it's doing so in ways that no one has yet to discover. Apple's sapphire deal has inspired speculation, but the reason for the deal may already be under our fingertips. Unlike Liquidmetal, we actually know that Apple has shipped tens of millions of devices to date featuring sapphire, a scratch-resistant glass replacement. 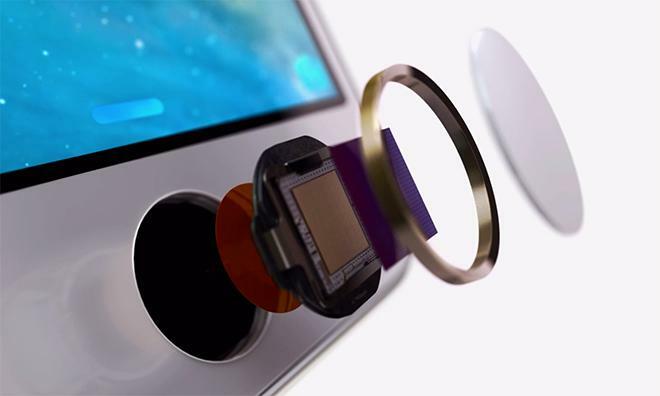 The tiny home button on the company's flagship iPhone 5s is made of sapphire, in order to ensure continued use of the Touch ID fingerprint sensor. In addition, the even smaller camera lens cover on the back of both the iPhone 5s and iPhone 5c is crafted from sapphire crystal, ensuring that potential scratches won't ruin a user's smartphone camera. The iPhone 5s and iPhone 5c had already been in customers' hands for over a month when sapphire maker GT Advanced Technologies announced a $578 million contract with Apple to supply the material to the company. Unsurprisingly, this news once again got fans —and the rumor mill —excited about entire iPhone and iPad displays made out of the wondrous material that is sapphire. Sapphire certainly has its advantages, as evidenced by its use in the small iPhone 5s home button. But if Apple were truly planning to build entire iPhone and iPad displays out of sapphire —this year, no less —it would need to overcome a number of considerable hurdles. 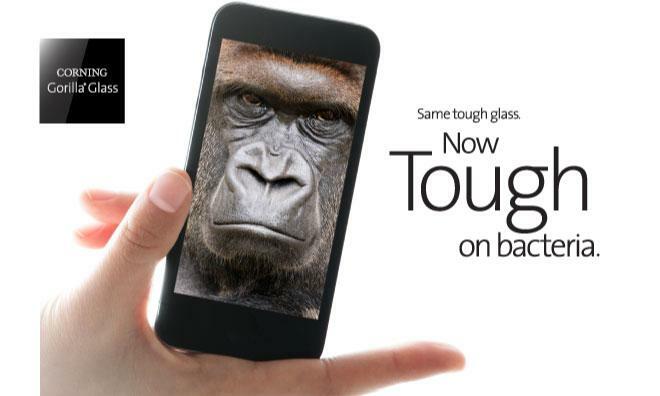 Corning is currently the worldwide leader in scratch- and crack-resistant glass manufacturing. The company declined to provide comment to AppleInsider for this story, but it already issued a public preemptive strike against sapphire hype back in May of 2013. In that statement, Corning admitted that sapphire is harder to scratch than its own Gorilla Glass, but also noted that sapphire is 67 percent heavier than its product. Considering how Apple continuously strives to make its products thinner and lighter, that doesn't sound like a material that the company would embrace. Corning also highlighted the financial issues associated with producing sapphire, estimating that it costs 10 times more to produce than its own glass. And its own durability tests suggest that in normal mobile phone use, in which the material must cover a much larger area than an iPhone home button, sapphire breaks more easily than Gorilla Glass. An executive from the company again panned sapphire as heavy and expensive, and also environmentally unfriendly, in statements made this March. Corning's Tony Tripeny noted that it takes about 100 times more energy to generate a sapphire crystal than it does glass, while the material also transmits less light, which could lead to dimmer screens or shorter battery life. Of course, Corning has a dog in this fight, and panning sapphire is in the company's best interest as it looks to maintain the dominance of Gorilla Glass in the smartphone and tablet space. But there is one company that has been shipping smartphones with sapphire glass for years: Vertu, a maker of luxury mobile phones that can cost upwards of $10,000. AppleInsider spoke with Hutch Hutchison, head of design and concept creation at Vertu, about the benefits of and problems associated with working with sapphire. Vertu is no stranger to premium materials, having famously crafted solid gold smartphones, and using materials like titanium, leather and alligator skin. The company began using solid sapphire crystal screens when it launched its first luxury mobile phone, the Signature, nearly 15 years ago. Hutchison explained that Vertu uses an incredibly slow process known as "edge framed growth" to produce sapphire for its modern smartphones. It takes several days to produce the material, but he said this is the only way to ensure it is free from defects and stresses. "Sapphire crystal screens are not easy to work with, but we believe that the customer benefits make our efforts worthwhile," he said. "In addition to the strength and scratch resistance, the clarity of sapphire crystal is also amazing." Vertu is now working with what it calls fifth-generation solid sapphire screen technology, available on the company's Constellation smartphone, which sells for $6,630. 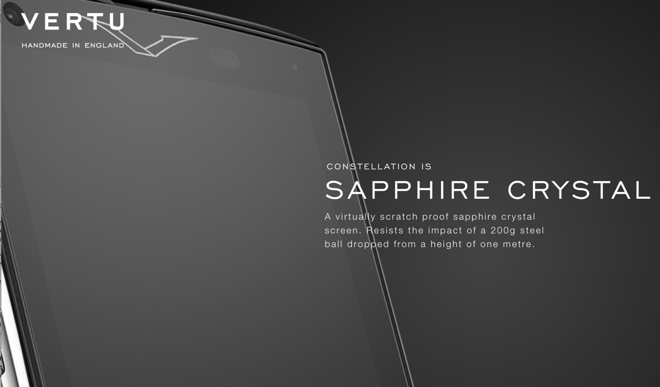 The company boasts that the Constellation's sapphire display is "virtually impossible" to scratch, and that the material is second only to diamond in its hardness. Of course, as Corning also noted, sapphire isn't some sort of magical material that solves the problems of glass without consequences. Vertu is well-versed in these issues. "As with any high-tech material, sapphire crystal has its own unique set of problems," Hutchison told AppleInsider. "It is slow, expensive and energy intensive to produce. It can take two weeks to grow each boules and the yield from each is low. It is also very difficult to cut, grind and polish; diamond tools have to be used for all of these processes." And that's just when growing and cutting sapphire. After that, the crystals need to be "expertly managed" to ensure its durability and optical quality, he said. Sapphire supporters believe that Apple and GT Advanced may have found some sort of breakthrough that would allow Apple to build entire iPhone and iPad displays made of the material this year, and keep up with massive consumer demand for those products. Hutchison, however, isn't convinced that the material is ready for mass-production in general consumer devices. On that subject, he referenced titanium— a material Apple famously used in its first in its first PowerBook G4 models, but quickly abandoned after the material presented a number of issues, most notoriously a problem where the notebook display's hinges would break. "Titanium, for example, has also been around for many years, is stronger and lighter in weight than aluminum —it comes with a myriad of advantages for mobile phones," he said. "However, it remains expensive, difficult to work with and therefore, rarely seen outside of the luxury industry. Sapphire crystal screens could break through to the mainstream or, like titanium, remain the preserve of only high-end luxury products. Right now, it is too early to say." So why spend $578M on GT Advanced? Outside of iPhone and iPad displays, sapphire supporters believe Apple could use the scratch-resistant material on its rumored "iWatch." While that does seem to be a more likely scenario in 2014 than sapphire-covered iPads, the truth is no one outside of Apple's secret labs has seen a so-called "iWatch," so it's hard to place much stock in a mythical product. Instead, the answer to Apple's half-billion dollar question may already be beneath our iPhone-unlocking fingertips: Touch ID. 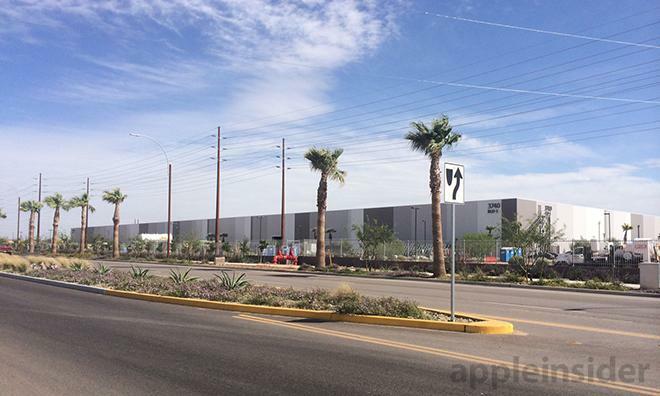 Apple-GT Advanced sapphire manufacturing plant in Arizona. It's expected that every new iPhone and iPad that the company ships this year will come with Touch ID fingerprint sensors. Presumably, those would be accompanied by home buttons made of sapphire crystal, and would launch in time for the holiday shopping season. And it's likely Apple will also continue to use sapphire crystal lens covers for its 2014 iPhones. And there's also the chance that the material could make its way to this year's iPad cameras. In last year's holiday season, Apple sold a whopping 81 million combined iPhones and iPads. Given the company's usual year-over-year growth with new product launches, it's likely that Apple will approach or even exceed 100 million iPhone and iPad units this fall. Assuming that most of those would be Apple's latest flagship models, and assuming that the latest iPhones and iPads all sport Touch ID, Apple would need sapphire crystal home buttons for tens of millions of devices. Devices that would be shipped in a single quarter. Suddenly, a $578 million investment in sapphire crystal doesn't seem so mysterious.